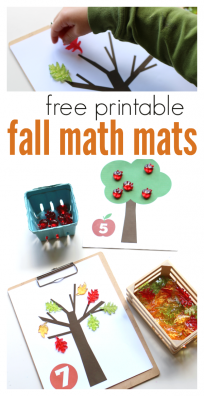 This map activity was a huge hit because it included pretend play. 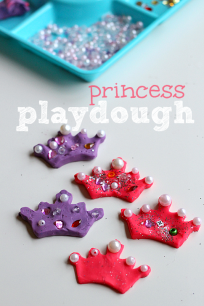 Preschoolers love jumping into a fun pretend play scenario and adding a big dose of imagination to a regular old activity. 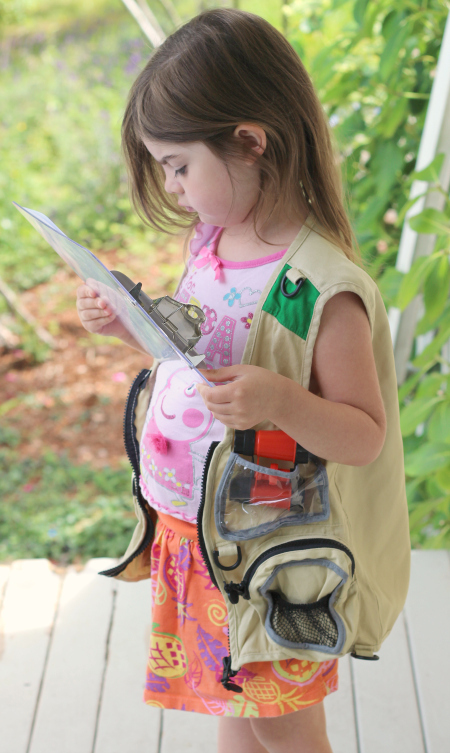 My daughter loves going on safari when she plays dress up so I used that love to turn a simple hunt into a map activity. 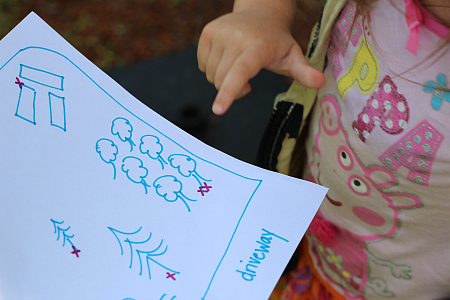 Reading maps is an important skill not just for the future but it teaches directions ( as we played we practiced left and right) and uses spatial thinking skills . This took less than 5 minutes to set up and even if you don’t have a yard you can pop the toys in a backpack and try this at the park, beach, or even inside your home. Gather your materials. 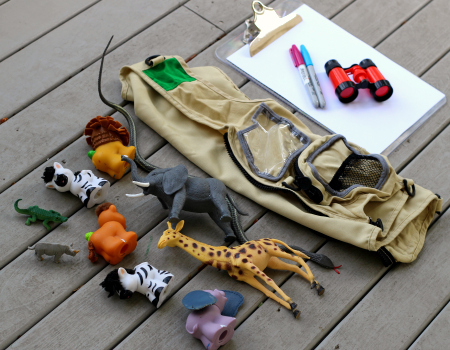 You will need some toy animals, toy binoculars ( or make some like these binoculars), safari dress up, a clip board, markers and paper for making the map. 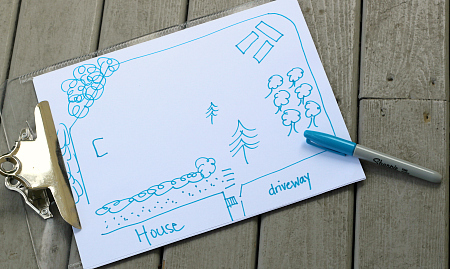 I started by mapping out our yard. It took me two tries before I got a somewhat accurate map. You could probably google earth your house and get a great shot of your yard but I don’t plan that far ahead so I free handed it. Then I added and X for each animal. Some spots have two Xs because there are two animals together. 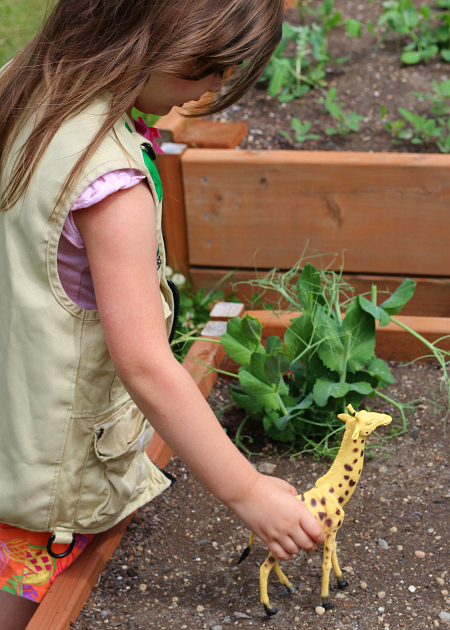 Invite your little explorer to get ready for the safari! 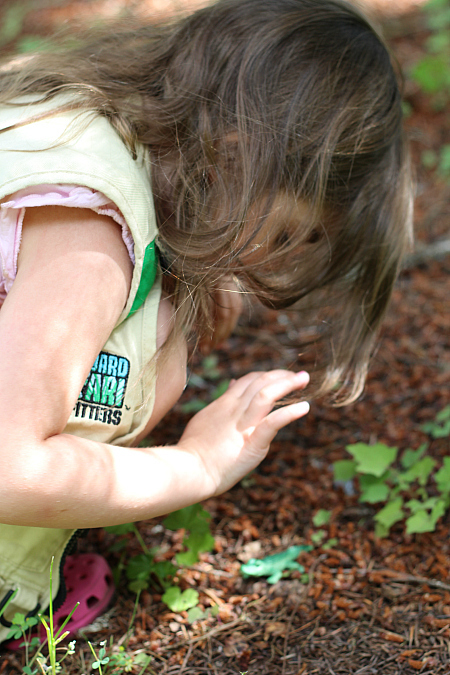 Show them the map and go over it with them by asking them if they know what it is. What each part represents etc… don’t explain it all to them, let them explain it to you and you can fill in any big blanks if they arise. 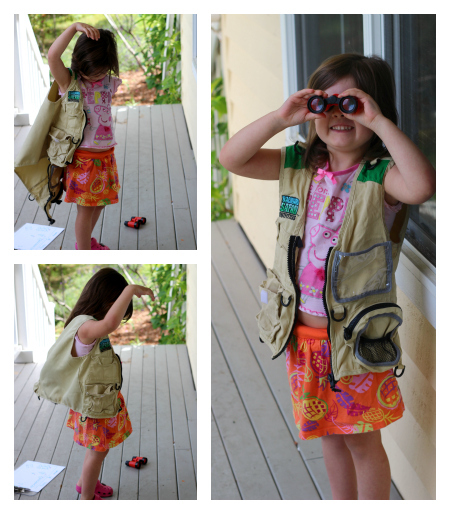 Get ready to find some animals. I only helped once when she was really getting frustrated. The little alligator was tiny and well hidden. 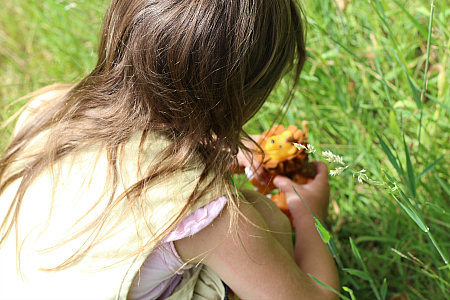 Every time she found an animal she kissed it and put it back. I explained that when you go on Safari you observe the animals but you don’t take them with you. 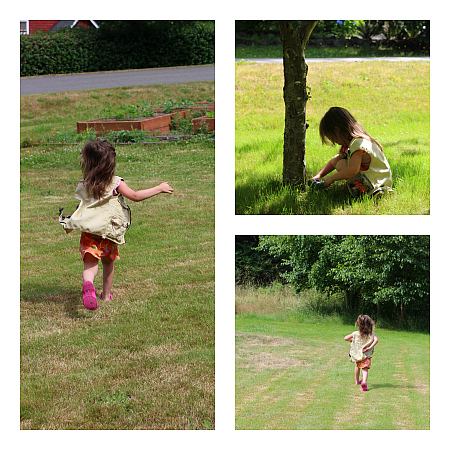 As we went along she found them even faster as well as got into the character , she was running so fast from one to the next. Make sure you take a few moments to talk about what kind of animals they are and a little bit about them. We talked about herbivores and carnivores and how they are different. She was very proud of herself for being able to read a map. 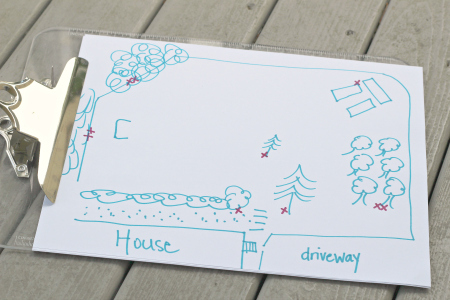 For older kids have them create their own maps of the yard and add the Xs on after. 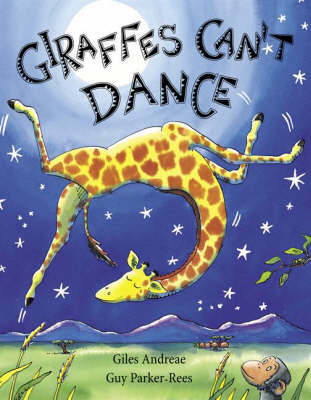 Giraffes Can”™t Dance by Giles Andreae is a very sweet story about a giraffe who gets laughed at because he doesn”™t know how to dance. 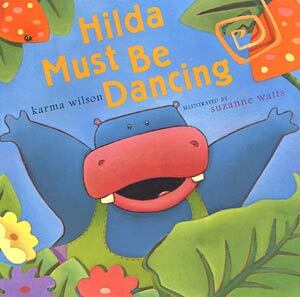 A cricket gives him some great advice and with new found confidence that different isn”™t always bad he starts to dance! This has been a favorite in our house for years! 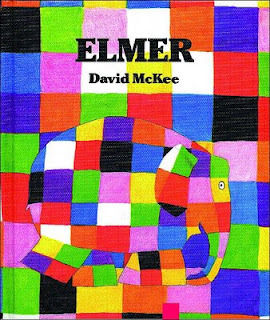 Elmer by David McKee is another book with a great message. Elmer is different, he isn”™t gray like all the other elephants, and he”™s a little bit of a goof too! He”™s not so sure he likes that though. Like all of us it takes some time for Elmer to accept who he is but in the end he sees that patchwork is just who he is! Do it inside instead 🙂 Ours was technically in our front yard. What a great activity. 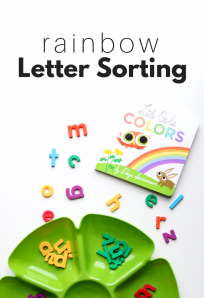 We would love to feature your activity in our KidsSoup member site (image only with link to your site/activity.) Please contact me if you have any concerns or questions. planning an event for my son and his friends, I think this would be right up their alley. Thanks for posting. And I love your map BTW. I always feel like I need to draw everything just perfect, or it won’t be good enough, but it would be good for them to use a bit of imagination. So much fun! I showed this post to my 10 year old and she planned the whole thing for my 3 year old. We just added our Power Wheels 4×4 as a safari vehicle and used an old digital camera to capture our safari finds. Thanks for the great idea! Oh my gosh that sounds amazing – what fun!